And it's not even done yet. The European Space Agency launched the Gaia satellite and its one-billion-pixel camera to space back in 2013. 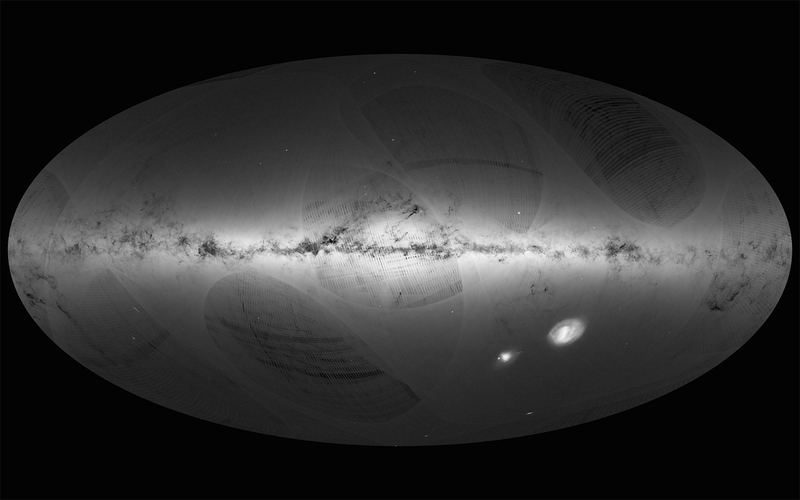 Gaia has been mapping the Milky Way ever since, and now the ESA has released a 3D map featuring over a billion stars -- we've never seen 400 million of those before -- based on the data it collected from July 2014 to September 2015. As you can see above, it shows how dense a billion stars look. Don't dwell on those weird lines cocooning the structure too much: they're merely artefacts from the way the satellite scans the galaxy. Team member Timo Prusti said this demonstrates that "it is possible to handle the analysis of a billion stars." Since they only used preliminary data to make this map, though, it only indicates the distances and movements of around two million stars. They got those numbers by combining information Gaia sent back with data gathered by the ESA's Hipparcos satellite, which operated from 1989 to 1993. The team plans to release a second map in late 2017 showing the positions, distances and motions of all 1.1 billion. Gaia will set its sights on remote galaxies, planets and even asteroids in the future. Hey, its camera is powerful enough to see an object on the moon that's the size of a human nail from way back on Earth. Might as well use it to the fullest. However, even its impressive camera can't detect some celestial bodies. Science says astronomers want to develop and deploy an infrared version of Gaia that can detect even faint dwarf stars and see through dust clouds.